To provide the highest quality service, intellectual capital and solutions to clients of all sizes andsectors in helping them mitigate the potentially catastrophic and enterprise threatening financial risks and exposures they will face stemming from a terrorist event. We work closely with companies and entities in multiple industries including aerospace, energy, chemical, utilities, major real estate owners & developers, banks, credit card and other financial institutions, manufacturers, information technology, software, internet, hospitality and gaming, sports franchises and venues and a host of other businesses and industries in identifying terrorism related exposures, providing liability and financial impact advice, mitigation strategies, options and cost effective ERM advice, protection and solutions. 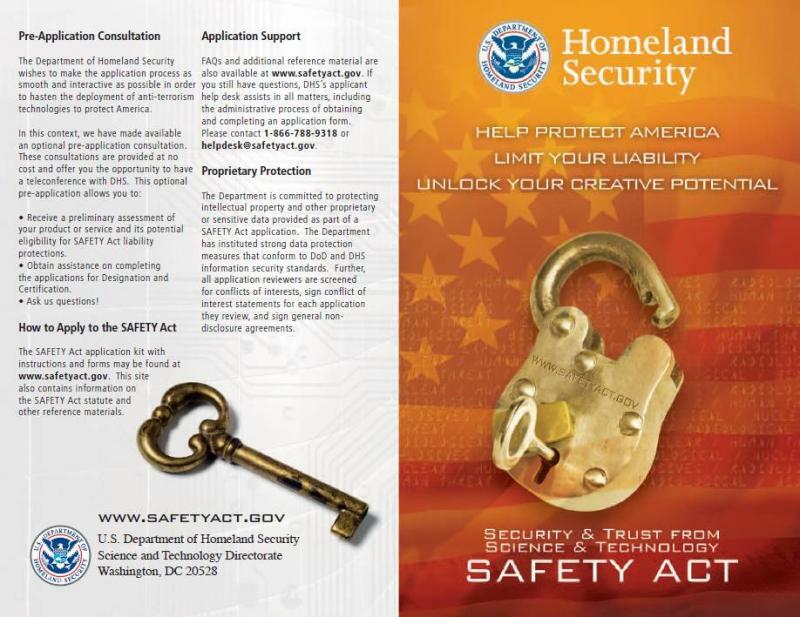 We formed SAFETY ACT CONSULTANTS to help educate organizations and assist them successfully navigate through the DHS application process. We pride ourselves in offering a total SAFETY Act solution from start to finish and then some. We consult on the application and approval process, modifications needed in contracts, leases, and insurance policies as well as overall procedures. This assures the best possible cost savings, workload reduction, liability protection and compliance. We also work with clients on marketing and creating new business opportunities for their approved products, technologies, facilities and/or services. We partner closely with clients and their representatives providing candid and professional / expert advice. We help them save time and money, obtain swift approval, provide the broadest protection possible, stay compliant and improve their marketing efforts. As an independent consulting firm, we can avoid the inherent conflicts many other types of organizations face. We are fee based, always work under written contract and fully transparent. Our compensation structure does not include income generated by selling other services, products or insurance that may be unnecessary. Potential liability, loss, cost or expense can arise directly from a terrorist event such as physical damage or destruction to a building. It can impact you indirectly such as a third party alleging a failure in your facility, product or service. It can involve a physical attack causing direct physical damage or result from a cyber attack causing financial harm but no other damage. The attack can be directed directly against you or directed against others. It could involve your facilities or your products, networks, services, advice, technologies, software or other intellectual capital you provide to others. It could involve your suppliers, vendors or customers causing you significant extra expenses, loss of revenue or even loss of opportunity. We also provide solutions for entities that may have an exposure for responding to, mitigating or aiding in the recovery from a terrorist event. The historical odds of any one person being killed in a terrorist attack are extremely low, about one in 9 million. This is a slightly greater risk than a person has of dying in an avalanche. However, if your organization is, as it should be, involved with homeland security protection, whether for itself or others, the odds of being impacted financially or involved in a suit resulting from a terrorist attack are significantly higher. We can help you demonstrate to key departments within your organization why SAFETY Act or other strategies may be needed and if so, why the organization has an obligation to address the issue. We will help you protect yourself financially. You simply cannot ignore the SAFETY Act - or take a chance because you believe the odds of a terrorist event involving you and/or your organization are still very small. If liability is imposed on you because of an allegation that you did not do enough to thwart or mitigate a terrorist event it is likely your organization will not survive the resulting financial impact. By addressing these issues up front, we also help firms reduce their directors and officers personal liability exposure. These could arise from a civil action following an event that alleges inaction or inadequate action in protecting the organizations facilities, people, liability and/or financial assets against what today can easily be deemed as a foreseeable event. This also helps avoid potential Sarbox related disclosure issues. Some of the solutions we provide, especially SAFETY Act approval, greatly enhance our clients ability to market their Designated or Certified products, technologies, services and/or facilities. We continuously work with suppliers, industry, trade groups and other professional societies and organizations in trading information on, understanding and promoting the SAFETY Act and its benefits. We partner with clients, lawyers and the DHS on expanding SAFETY Acts potential application to a wider range of products, facilities, advice, procedures,services and technologies. We partner closely with you and your team. We listen and learn to help us fully understand your business challenges, goals, priorities, limitations and specific needs. Once we understand the above, we create and help you implement customized, practical and economically feasible solutions that match your needs and objectives. We operate fully transparent. We involve you in every key step and every decision that may impact you. All costs, fees and alternative options will always be explained and provided to you for specific approval. We provide you with as much information as possible so you can make informed decisions on strategies and then we deliver the results. We will quickly become one of your most trusted strategic partners. We operate out of the box and continuously evaluate and even challenge conventional thinking. We maintain a new, creative and entrepreneurial new approach to each and every engagement we undertake. We continuously strive to improve our knowledge, strategies, products and services. Depending on the complexity of a given client's exposures, geographic location, readiness for SAFETY Act application and the need for specific expertise, we may our utilize formal and informal business partnerships and relationships to provide the highest level of intellectual capital and the most cost effective services, advice, and best solutions possible. We will always inform you if, and who, we recommend for your specific needs and will only use them upon your specific advanced approval. Our contractual relationship with you, and the fees agreed upon for services at the time of engagement fully contemplate and incorporate any of these relationships. The use of a technical, legal, local or other partnership arrangements will not increase the cost to you, and in many scenarios, often reduces the overall cost to you. If you and we deem that involving an additional expert and/or partner firm at a later date is beneficial, we will always look to you to agree to any additional costs and/or fees in advance and in writing. No surprises! 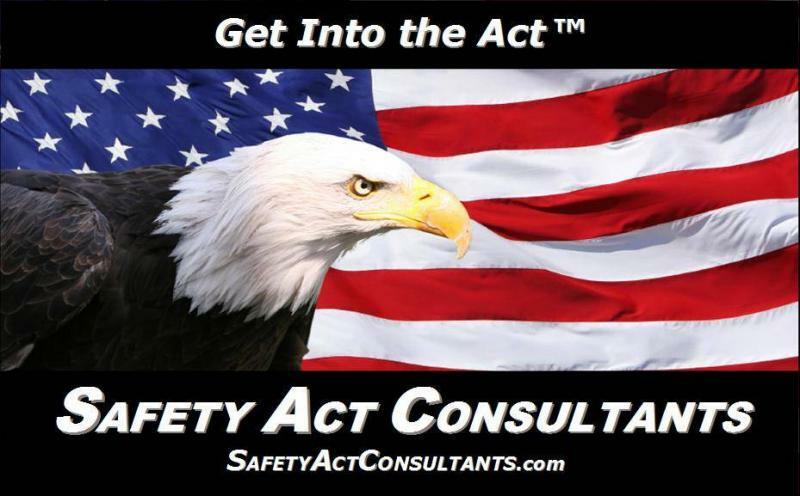 SAFETY Act Providing expert guidance on the SAFETY Acts often-arduous approval process. Government Relations Connecting with the people who matter, from the Administration to Capitol Hill. Homeland Security Technologies and/or Services Assessment and Business Development Developing strategies to bring innovative technologies into the public and private sectors. Public Affairs Fine-tuning our clients public relations outreach with clear and effective messaging. Defense and Security Delivering expert knowledge of the policy, procurement and process of the homeland security and defense industry. Critical Infrastructure Assessing security risks and planning for the continued safety of the nations most important assets. Transportation / Aviation Finding solutions amid rising energy costs, global competition and complex governmental regulations. Methodology Aid the client in developing strategies which support their business focus, needs and enhance core competency. Resilience and Continuity of Operations Reduce the frequency and severity of incidents, and the costs to an organization associated with response, recovery, lost productivity and liability. Business Development Provide strategic guidance for companies seeking new opportunities to grow and expand their reach. Business Risk Mitigation Evaluate readiness and ensuring resiliency as the range of man-made and natural threats expands. Maritime Security Ensure supply chain security and economic resilience. 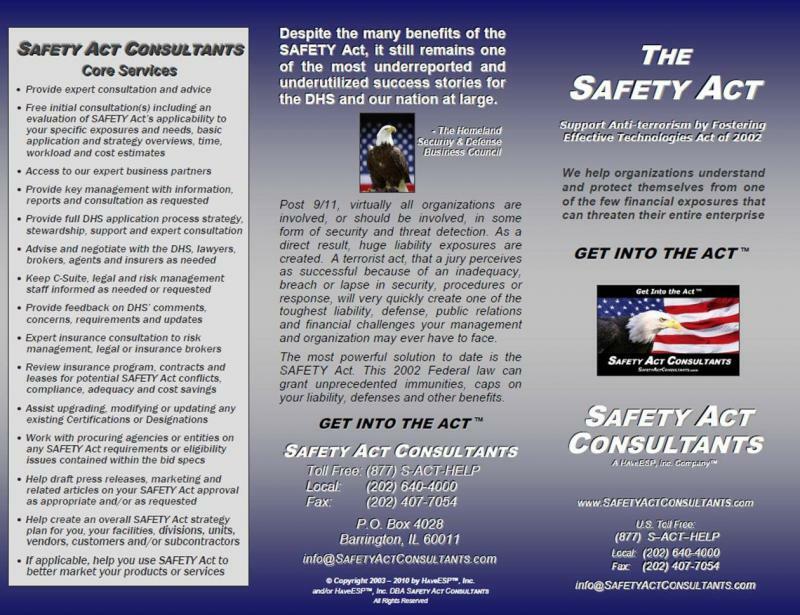 Bob is the founder of SAFETY Act Consultants. He has extensive experience in aerospace, insurance, captives, terrorism financial impact mitigation, as well as being an advocate and expert on the SAFETY Act and its potential applications throughout all business sectors including cyber related risks. 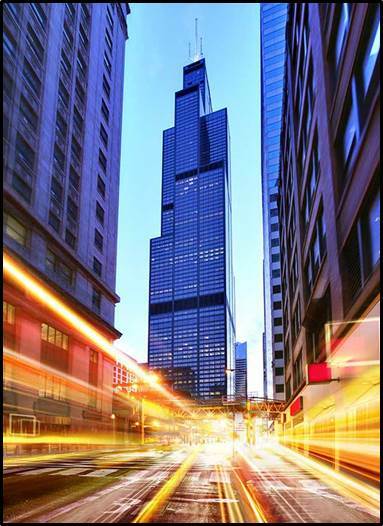 Has over fifteen years experience with two top global insurance brokers specializing in aerospace, homeland security, terrorism liability mitigation and risk transfer. He has represented many Fortune 100 high profile clients as well as small entrepreneurial start-ups. Has an additional ten years holding leadership positions for various aerospace insurance companies including top management and key strategy, business and product development roles. Has a strong background in contracts, contractual language and enforceability as well as extensive experience authoring insurance policy coverages and wordings. Has a strong background in government contracts, legislative and legal issues including the FARS, PL 85-804, SAFETY Act and other related issues. Has testified as expert witness on insurance policy language, coverage interpretation and provided extensive coverage opinions. Has the honor of being a US Air Force veteran. Is a licensed FAA Commercial Pilot, Ground and Flight Instructor. 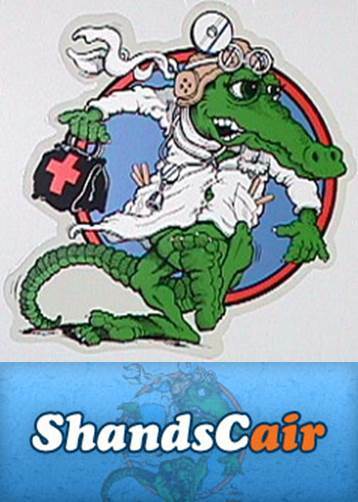 Was a air ambulance pilot for Shands Teaching Hospital at the University of Florida. Was a first responder as a firefighter, auxiliary﻿ police officer, EMT and MICU (Mobile Intensive Care Unit) team member. Bob earned his B.S. in Aeronautical Science and an A.S in Management from Embry-Riddle Aeronautical University, Daytona Beach, FL. He has taken many post-graduate and technical courses in anti-terrorism, security, insurance, law, entrepreneurship and management. 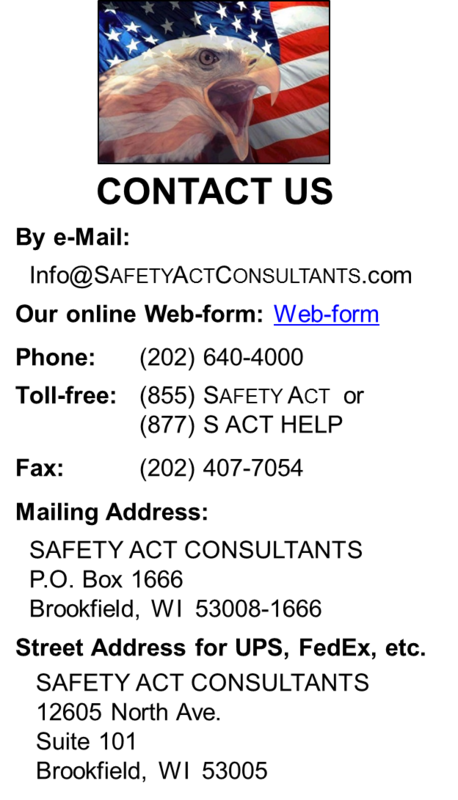 He is active in many technology and entrepreneurial organizations including the Rice [University] Alliance for Technology and Entrepreneurship, University of Houstons Center for Entrepreneurship, The Houston Technology Center, Houston Interactive Marketing Association, The Houston Strategic Forum, MIT Enterprise Forum. Bob is a member of ASIS International (f/k/a American Society for Industrial Security), Information Systems Security Association (ISSA), International Association for Counterterrorism and Security Professionals (IACSP), National Defense Industrial Association (NDIA), American Institute of Aeronautics and Astronautics (AIAA), The Chicago Council on Global Affairs, Aircraft Owners and Pilots Association (AOPA) and the American Legion. NBC News: “Security at sporting events eyed after Boston attacks” - April 17, 2013. Kevin McCarthy is a Homeland and National Security practitioner experienced in transportation security and operations, critical infrastructure protection and resiliency. Kevin has more than 33 years experience flying commercial and U.S. Air Force aircraft and was selected as one of Delta Airlines first captains of the new Boeing 777. During his tenure at Delta, he also served as an expert advisor on aviation and operations security to the U.S. Government and the airline industry. As a senior official in the Air Line Pilots Association International (ALPA) he directed the industrys first Office of Intelligence & Emerging Threats. In this role he worked to enhance information sharing among ALPAs 65,000 members, U.S. Government agencies, and the Intelligence Community. In 2002, he founded and directed the National Center for Aviation Security, a non-profit center dedicated to scholarly research for the establishment of leading edge security solutions for the aviation industry. Since leaving the cockpit in 2004, Kevin has advised many clients and authored articles on aviation and maritime security operations and piracy prevention. Kevin was recently appointed to the Security and Intelligence Advisory Board of Jefferson Waterman International, a Washington, DC firm exclusively focused on international business and government policy. In addition, he serves on the Federal Advisory Board of Air Patrol Corporation a provider of Wireless Threat Management Solutions and continues on the Board of Directors, TigerLight Inc, a non-lethal self-defense systems company. The American Committees on Foreign Relations are pleased to have Kevin on their distinguished speakers list, where he serves as a regular guest lecturer on global security operations issues. He serves as a consultant to the Department of Homeland Securitys Homeland Security Institute; is a member of The World Bank, Aviation Safety & Security Working Group; and a founding member of the U.S. Department of defenses Directed Energy Task Force's Laser Eye Protection Group. Heritage Foundation lists him as a contributor to the report in June 2009. During his airline career, Kevin was leader in creating the Federal Flight Deck Officer program for Department of Homeland Security and its Transportation Security Administration becoming one of the first sworn officers protecting U.S. airliners. At the request of the Iraq Coalition Provisional Authority in 2003, Kevin led a team of experts to develop operating procedures for reopening the Baghdad International Airport to civilian aircraft. He provided his expertise as an advisor to the U.S. House of Representatives Select Committee on Homeland Security and to senior DHS officials on securing commercial aviation operations and airliner missile defense. MoonRaker Associates, Kevins independent consulting firm focuses on national security operations, continuity, and resilience. As an affiliate of SAFETY ACT CONSULTANTS, Chicago, ILand Catalyst Partners, Washington, DC he makes available to the firms his wide aviation and business experience. He leverages a vast network in applying his expertise to developing solutions, which enhance the protection and overall effectiveness and resilience of operations in both the public and private sector. Recognizing the importance of utilizing innovative technologies an effective use of human capital to enhance and secure operations throughout an enterprise. For the geospatial intelligence company SPADAC Inc, he was a founding member of the Board of Advisors and expert consultant for five years until acquisition transformed the company into GeoEye Analytics. Kevin holds a B.S. degree in Earth and Space Science, from West Chester University, PA, received advanced intelligence officer training at The Centre for Counterintelligence and Security Studies, Arlington, VA, and graduated from the Federal Law Enforcement Training Center, Glynco, GA. Carrying a current US government security clearance, he resides Park City, Utah. Ms. Schick has over twenty years experience in technical research, writing and library science. Experience includes supervising, training, curriculum development, project management, technical research, drafting, writing and budget setting. Excellent communication, analytical, problem solving, organizational, writing and management skills. Works with small businesses through Fortune 100 type clients at C-suite, inside and outside counsel and the Department of Homeland Security (DHS) in applying SAFETY Act protections across multiple industries, products and services. Key member of the team that provides clients with a total SAFETY Act solution from start to finish including insurance, marketing strategies and follow-up. Responsible for SAFETY Act research, technical writing and application review. Completed Designing Instruction for Web-based Training, presented by Darryl L. Sink & Associates, Inc.
For a prinable version, click here.